More and more people are beginning to consider that the "perfect water" system would combine the purity of Reverse Osmosis (RO) and the tremendous benefits provided by alkaline, ionized water. Historically, this has not been easily achieved for a variety of reasons. The experts at AlkaViva have solved the problem of combining these two phenomenal water technologies. Now you can have perfectly clean and perfectly healthy water! Note: Using a reverse osmosis/remineralizer system, is adequate filtration for most water ionizers. If you have a Jupiter water ionizer, H2 Series water ionizer or a Nexus water ionizer you can request "blank filters" to put in your water ionizer as a way of saving on filter-replacement expenses. Just tell us the name/model of your water ionizer in the comment box of the order form. If your ionizer is from a different manufacturer they may make blank filters too. Check with them; it could be a big savings to you in filter costs. This Reverse Osmosis system comes with reconfigured R/O filters in order to give you the best possible water ionizer performance, and in addition if you purchase this reverse osmosis system, it comes with a special Permeate Pump, at no extra charge! This simple, yet revolutionary device [Permeate Pump] uses no electricity as it is powered by the hydraulic energy of brine water [brine water is the waste water of R/O] usually lost to the drain. The Permeate Pump forces product water [also called "permeate"] into the storage tank, reducing membrane back pressure and maximizing available feed pressure. It also dramatically improves the efficiency of R/O water production, reducing waste water by up to 80%. Here's how it works. A standard reverse osmosis unit is controlled by an auto-shut-off, which shuts off when the tank reaches somewhere around 40 pounds of pressure per square inch [40 psi]. With a permeate pump the tank doesn't need to shut off until it reaches nearly the same pressure as your incoming city water [i.e., 60 psi]! This is particularly beneficial to well owners, who may only have 40 psi of pressure, such as low-pressure wells. To keep your RO System functioning at an optimum level, its filters need to be changed annually. Additionally, the RO Membrane needs to be replaced every two years. Note: The remineralizer filter may need more frequent changing. You should test your ionized water output after about six months to determine when it's time to change that, or better yet, just plan to add in another remineralizer filter every six months...to be sure. R/O is by far the most popular water treatment technology in use in the USA today. R/O utilizes a technology called nano-filtration (typically .009 micron) to physically filter and remove virtually all suspended and dissolved material in water. To put a micron into perspective: a postage stamp is more than 25,000 microns long, the eye of the typical needle is usually 749 microns wide, a human hair is 40 to 120 microns in diameter, a grain of salt is about 70 microns across. The smallest particle visible to the naked eye is about 30-40 microns. RO filters to 9/1000th of a single micron. The quality of R/O membranes vary but typically between 90% and 98% of all suspended materials (good and bad) are removed and flushed down the drain. R/O and Water Ionization are often thought of as polar opposites in terms of their effect on the water. R/O water is typically acidic and virtually mineral free, while ionized water is high in pH and rich in alkalizing minerals. The negative impact of more acid in our body (that is already too acidic due to chemicals, stress, poor food, and lack of healthy exercise) is obvious. Furthermore, many health experts believe that mineral-free water can be harmful and can actually lead to a de-mineralization of the body. Pure water molecules attach to molecules they come in contact with and flush them from the body. This includes the flushing of beneficial alkaline minerals, which is detrimental to our delicate acid/alkaline balance. The good news about R/O is that virtually all dangerous contaminants are removed so you get virtually pure water. There are however some very difficult issues with R/O - especially when you attempt to mate it with an ionizer. First, in addition to removing all the contaminants, R/O removes almost all the naturally occurring minerals from the water. Ionization needs the minerals to work, so an ionizer will not usually work on R/O treated water. Note: Even with a remineralizer an RO system will give a fairly low pH water unless you use a water ionizer in conjunction with it. This particular RO system is made for use with an ionizer. It has the right minerals, size of tank, pressure, speed and other factors that a water ionizer needs built-in. Here's how the RO and water ionizer systems work together: Provided that the water has enough minerals, an ionizer generates Hydrogen gas at the cathode (increasing both the pH and antioxidant-levels and making it extremely healthy and healing water). It also concentrates whatever alkaline minerals are in the water into the alkaline water stream and makes them bio-available with a negative charge. Read more about the health benefits of Hydrogen gas. How much water will this system produce? 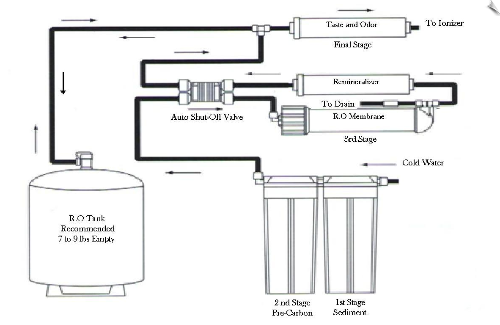 R/O storage tanks consist of a container with an internal rubber bladder. The tanks are rated by the volume of their external shell, but the actual amount of water that can be extracted from the tank is much less. On a typical storage tank, approximately 3.2 gallons are available with an extraction capacity of only around 1.5 gallons. Since water ionizers split alkaline and the acidic streams, one can expect to draw about .84 gallons of alkaline water and .66 of acidic before the tank runs dry with a traditional sized tank of 3.2 gal. Therefore, the AlkaViva R/O includes a high capacity 5 gallon storage tank. AlkaViva has dedicated a tremendous amount of time and effort into the design and development of the most sophisticated and convenient R/O system with re-mineralization on the market today. The AlkaViva Reverse Osmosis [RO] system incorporates a high volume 100 gallon per day R/O membrane with a nice sized storage tank . What are Your Replacement Costs? Every year you'll need to do a filter replacement. On the 1st, 3rd, 5th... years you should use the "annual replacement pack, which includes the 2 filters and remineralizer. On the 2nd, 4th... and so on [alternate years] you should use the "bi-annual replacement pack, which includes everything in the annual pack plus a new "membrane".